It was a frosty morning during this time of an ever weakening light from the Antarctic sun. The spirits of this cold frozen land can now feel its withering rays as she fights to get above the horizon. And even after she wins that battle, she struggles to rise and can only manage to hang low in the sky even when she’s at her most powerful at the noon. For only a short while, the proud queen of the heavens was able to push back the cold winds of the icy continent that never thaws and only grows by heaping mounds of ice and snow. 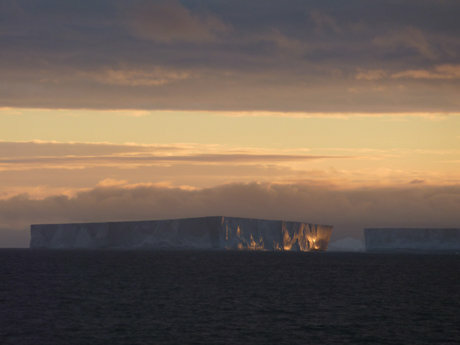 It was on such a morning that the last of the spectacular sunrises occurred over the iceberg fields. I know it was the last, for today (2/24/10) we have been driven for the last time off the shelf by the ever expanding ice. So with little time left, we will drill another site in the deeper waters far from the dangers of the fast expanding ice as the frosty winds from Antarctica become more emboldened, chilling the sea and air all around us. A light snow fall from overnight greeted us as we made our way for what was to be our last spectacular sunrise over the mountains of ice that slowly moved past us. The sun first rose like in a clouded majesty, then burst through the mist in a fountain of light, torching the clouds in a fiery multi-color plume in the sky. Like colors dipped in heaven, these most radiate beams of light were cast onto the icy mountains that slowly moved through these now nearly freezing waters. And so the last of the ice we have seen. It was a wild magical ride.